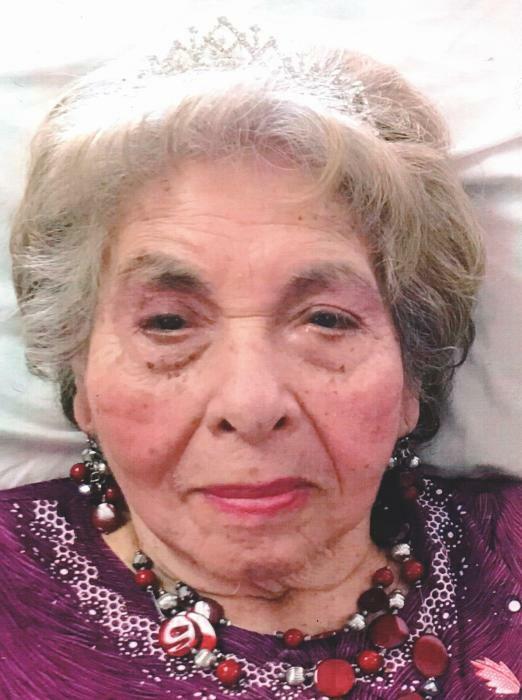 Eloisa Ortiz ( nee Rivera ), 94, of Hopelawn, passed away on Tuesday, September 4, 2018 at Alameda Care Center, Perth Amboy with her family by her side. Eloisa was born in Jayuya, Puerto Rico and came to Hopelawn many years ago. She was a homemaker and loved spending time with family and friends. She is preceded in death by her beloved husbands Pedro Mari and Cruz Ortiz; loving daughter of Guillermo and Francisca ( nee Rodriguez ) Rivera. She is survived by her devoted children Teresa Gonzalez, Maria D. Rodriguez, Cruz Jr., Fernando, Nilsa Ortiz and her husband Aurelio Marmol, Miguel A., Manuel A., Angel M. and Pedro P. Ortiz; dear sister of William and his wife Nilsa Rivera; adored grandmother of 37, great-grandmother of 72 and great-great-grandmother of 5; cherished aunt of many nieces, nephews and cousins. A Funeral Service will be held on Friday, September 7, 2018 at 10:30 am at the Gustav J. Novak Funeral Home, 419 Barclay Street, Perth Amboy. Interment will follow at Rosedale Cemetery, Linden. Visiting is on Thursday from 2 ~ 4 & 7 ~ 9 pm.